Rugby World Cup is the brainchild of French developer Cyril Plassard. The app has just been updated to version 1.4.0.0 and brings some notable changes to the table. We’ve outlined these changes below. 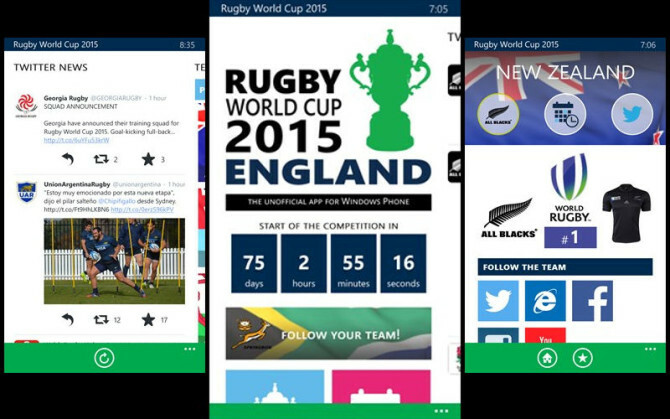 Using Rugby World Cup for Windows smartphones, you can get results for different teams, follow the latest news, interact with teams on Twitter once you connect your Twitter account, view agendas for Rugby World Cup 2015 and more. The tournament will be hosted by England from September 18th to October 31st, 2015 and marks the eighth Rugby World Cup. According to the developer, Rugby World Cup is the first app that is 100 percent free and independent that is dedicated to the Rugby World Cup 2015. In addition, the application was exclusively developed for Windows Phone. You can download the new and improved Rugby World Cup update via the QR code or link below.